I’m from Philadelphia, so this was bound to happen eventually. I mean, it does make me an expert on Philly cheesesteaks, right? I modeled this delectable vegan creation after my favorite greasy sandwich from my favorite south Philly steak shop. 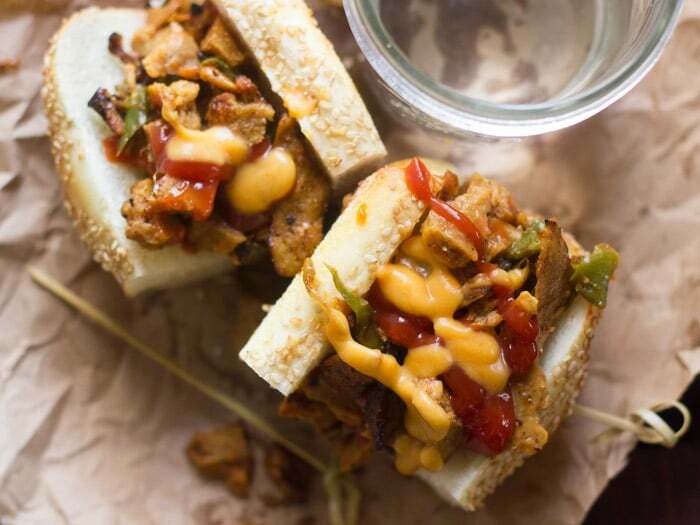 I tried for years to recreate the seitan steak sandwich that I’d enjoyed so many times at that little café. My first attempts weren’t bad – they were just a little soggy and not all that flavorful. These, on the other hand, were fantastic. I attribute that to a few things. First, seasonings. Long hots, garlic, paprika…as far as I know, these aren’t normally a part of normal cheesesteak sandwiches, but neither is seitan or sweet potato cheese, so whatever. They make it taste good! The heat from the peppers in particular really adds something, and as my old favorite veggie steak from the Italian market had long hots, so does my new favorite. Then there’s the oil. This recipe doesn’t call for a ton of oil, but for a long time I told myself I wanted a healthy cheesesteak, so I used virtually no oil. That’s why my early versions were on the soggy side. Just the right amount of oil and heat gets you some nice crispy little edges on the seitan, which makes a huge difference. Finally, the cheese. The seitan steak that I used to eat in Philly was made with dairy cheese, but I wanted a vegan version. I had a hard time figuring out what to do about this for a while. The conventional cheesesteaks I’ve seen all come with an orange squirty cheese on top. 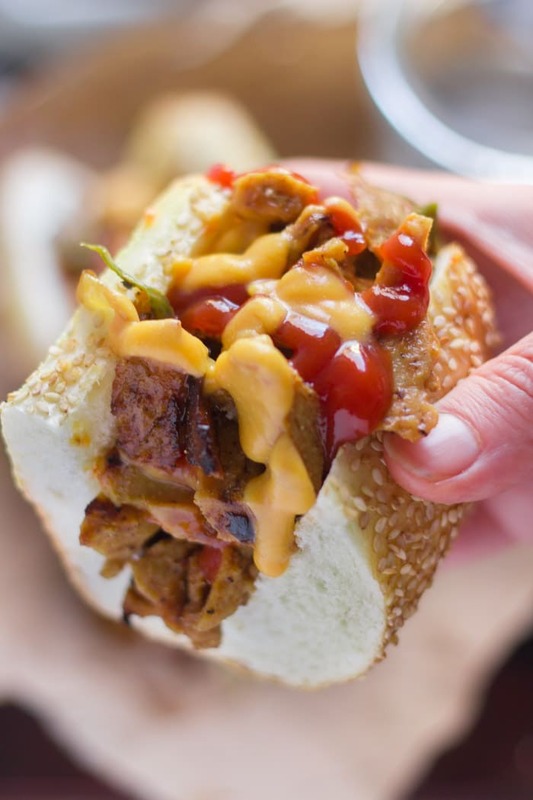 I’m not big on commercial vegan cheeses, and not even sure if anyone has attempted to replicate orange squirty cheesesteak cheese. One day I realized I’d inadvertently created my own vegan version of orange squirty cheese. What an amusing revelation that was. Anyhow, it worked out perfect, and while I can’t necessarily comment on the authenticity of the finished product, I can promise that it is absolutely delicious. Coat the bottom of a medium skillet with oil and place it over medium-high heat. Add the onion, hot pepper and garlic. Sauté until onions and peppers are slightly softened and browned in spots, about 3 minutes. Add the seitan, black pepper, paprika, and salt. Continue to sauté until the seitan begins to crisp in spots, about 3 more minutes. Divide the seitan mixture between sandwich rolls. Thin the sweet potato cheese with water until desired consistency is reached, and use it to top sandwiches, along with some ketchup. Hell to the yes. Philly represent! *high fives* :) These look mindblowingly delicious. Seitan is expensive to buy and not that tasty..compared to homemade. Its easy easy to make. This sandwich looks wonderful and will be dinner this weekend. This dish was so amazingly tasty. We substituted the hot pepper with reg. green pepper. I served with a side of creamy (non-vegan) coleslaw. The cheese sauce went into burritos the next day and the rest I just ate with a spoon because it was so darn delish. I signed up for your newsletter because of this recipe. You are a goddess. Thank you. Awesome!!! Green pepper sounds like a nice sub for a milder version. I’m so glad you enjoyed them. Thanks Lisa! OMG this is really incredible!!! I need to try this!!! 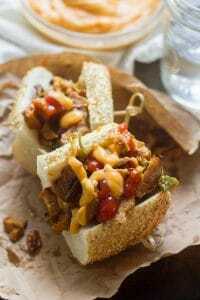 Philly cheese steaks are just my EVERYTHING and I have been panicked to create a vegan version…super glad that now I will be able to!!! Yay! I hope you enjoy them as much as I did! Do you have a recipe for the vegan sweet potato nacho cheese? Yay!! I’m so glad to hear that! Thanks Danni!! 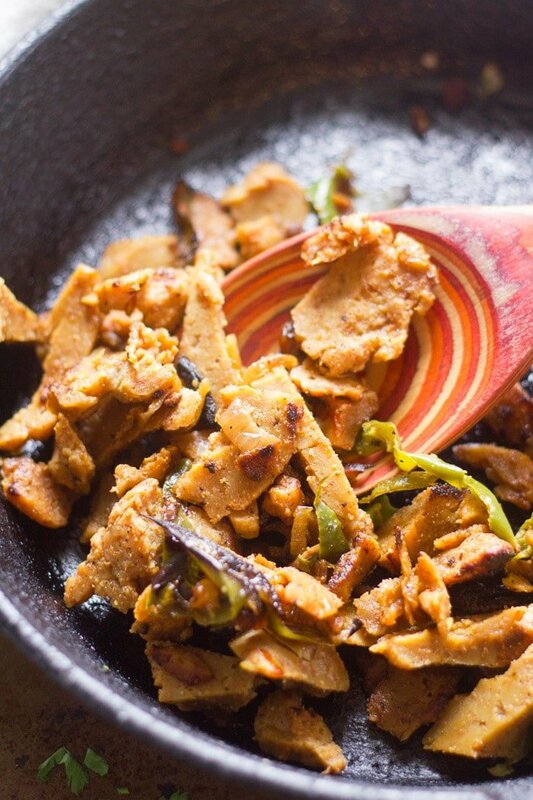 Do you have a recipe for homemade seitan? Yes I do have a recipe for homemade seitan. Thanks for asking – enjoy! Delicious, I love all of your recipes, keep them coming. Thank you! I absolutely will!! This looks amazing! I’ll have to try this. Yummy! Thanks for sharing it. Never having eaten anything like this but my US husband has, should the seitan be more beef flavoured or does it not matter as long as the seitan is in strips and crispy? I usually make a chick’n flavored seitan with poultry seasoning and nooch. 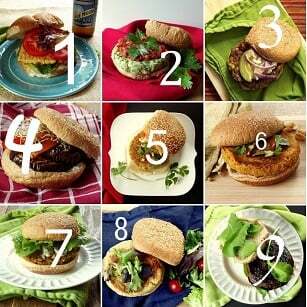 Thanks for all your recipes – I share many of them to my South African vegan FB group. I use store-bought (WestSoy) or my basic homemade seitan recipe, which works for pretty much anything (as opposed to a beef flavored version). I think a version with poultry seasoning should be fine. :) I’d love to hear how it works out if you try it! Going to be trying these on Sunday as Super Bowl fare. Go EAGLES! These are perfect superbowl food!! Enjoy and go Eagles!! This was delicious! We used Poblano peppers which were just the right amount of heat. Everyone loved the nacho cheese sauce and my son didn’t even know there was sweet potato in it. We’ll definitely make this again! Oh…I bet this was awesome with poblanos! Glad you enjoyed it!